With so many cool new one page WordPress themes on offer, why not get your stunning new parallax effect enabled one page website today! With smart content elements and customization features, these themes are ready to roll. 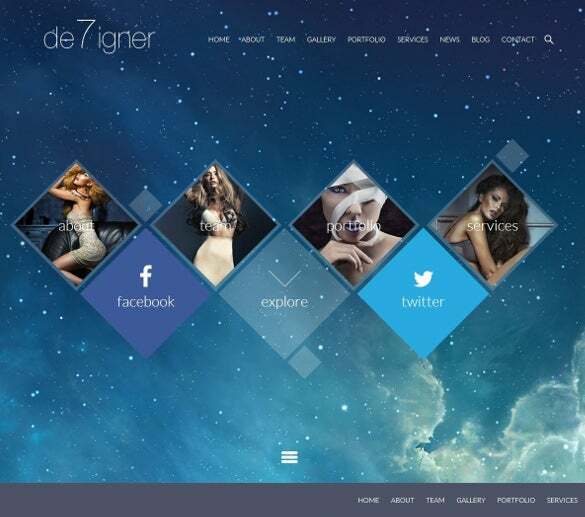 You can also One Page Website Themes. 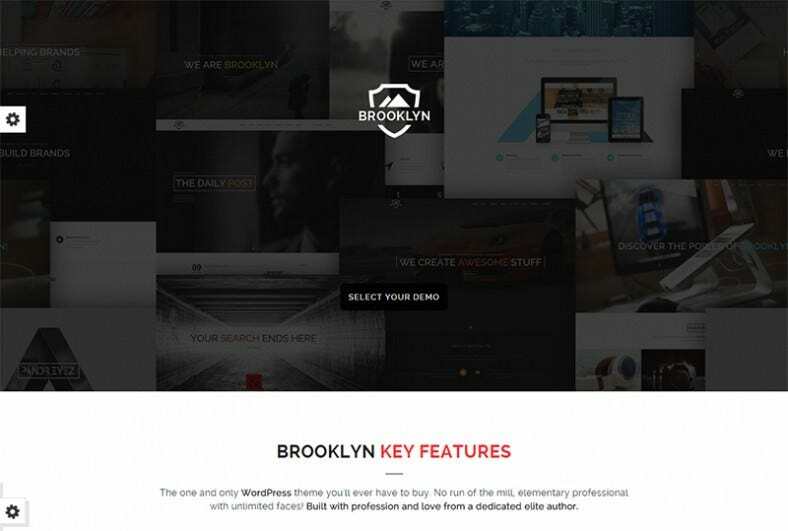 This is a theme layout that can be easily attained from the internet. This is a template that can come in the form of word document, PSD and PDF. The template format is highly professional in its design. The color play is also very attractive. 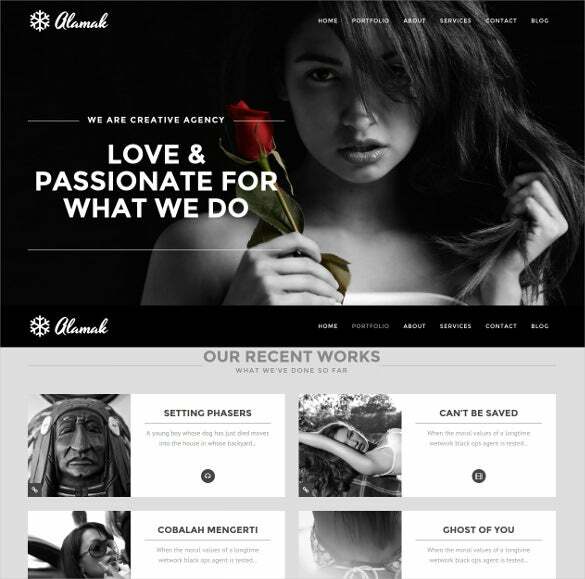 To create a one page parallax WordPress theme, Creative One Page Multi-Purpose WordPress Theme is an ideal option for photographers, travellers, web design agencies, environmental organizations or even for music and video producers. With the retina ready images and SEO optimised content; it is possible to create an exclusive website with infinite customisation options. To create beautiful and unique visual layouts, WordPress One Page Template is a trusted name which is used by professional web designers, bloggers, and freelance photographers. Bold, modern, and beautiful with meaningful colour choices, full RTL support, easy navigation, multiple menu areas, Sucuri.net for secured website, and fully responsive website makes the theme loved by experts. This is a template design that has a very interesting look. The template has a host of interesting images that are also very much print ready and are retina friendly. The template is SEO friendly. 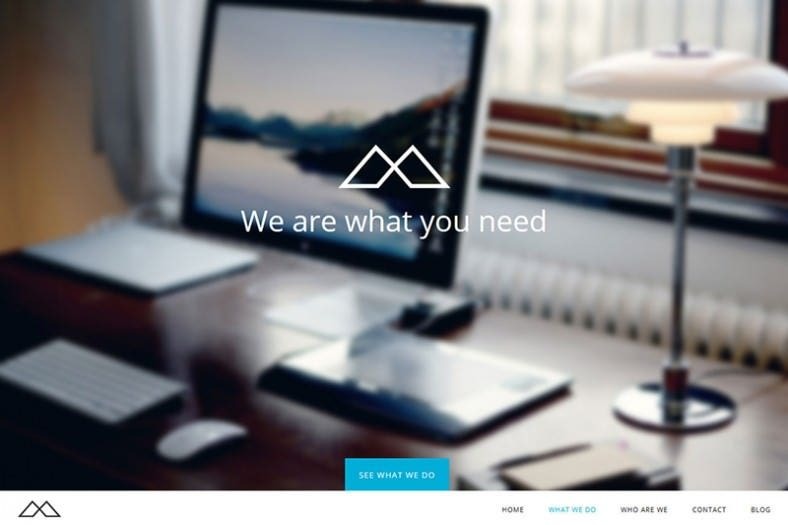 If you are looking for a light and simple yet modern theme for your website, Modern One Page WordPress Theme is the one which provides sliders, infinite scrolling, popup variety of content presentation methods, and fully responsive design. Built on flexible bootstrap framework with advanced HTML and CSS3 coding, it has easy admin set up for smooth navigation. This is a template that has a very stylish look. The features are very basic and simple. Installing this template is again very easy. 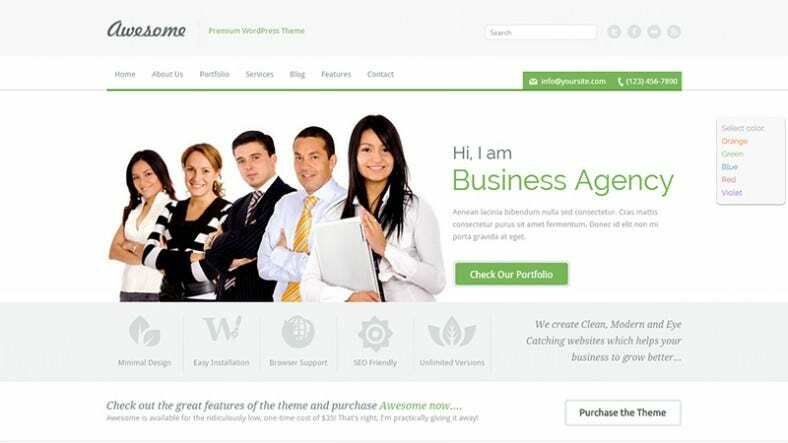 Websites that are created with the help of this template can be operated with a lot of ease. 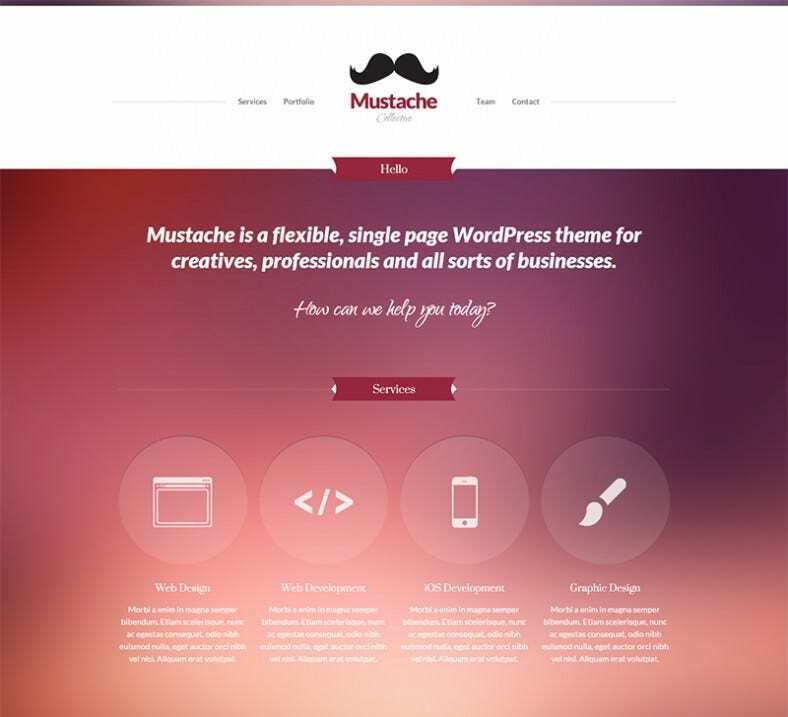 This is a One Page WordPress theme that can be trusted o create some of the most responsive and attractive websites. The template can support a large volume of information. This information can be presented in bullet form or paragraph style. 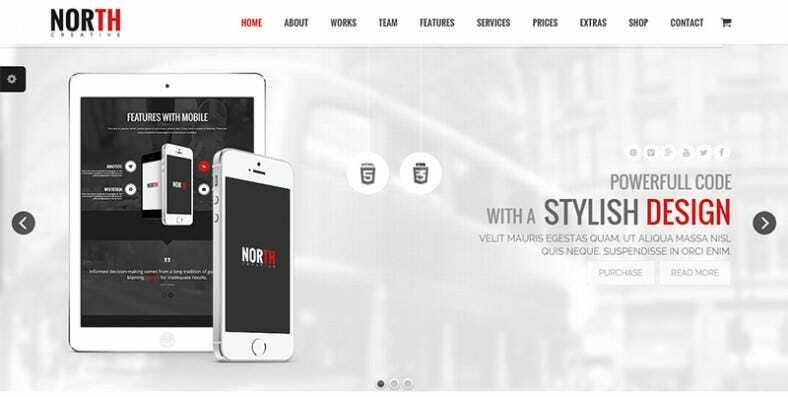 With customizable and easy to use features, Responsive One Page WordPress Theme is ideal for the freelancers and the beginners to use. 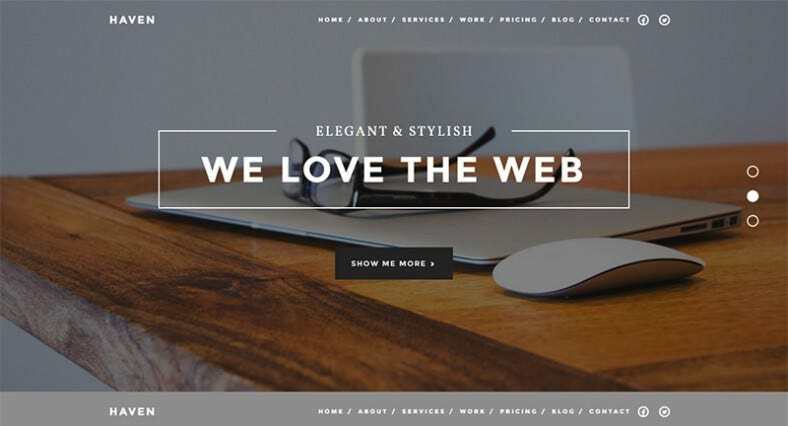 This theme is optimized for a Responsive viewing experience with icons, graphics and retina ready images. Easy auto-installs with bootstrap framework make it perfect for the use of non-programmers as well. 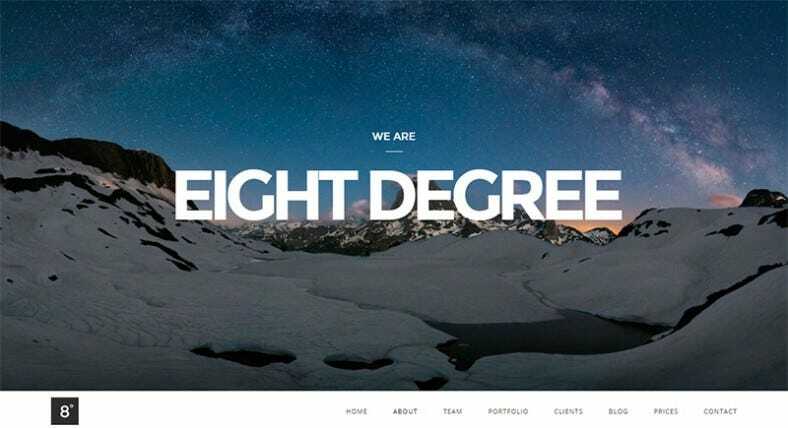 To create an ultimate professional portfolio, Flat OnePage Parallax WP Template is a trusted name among the web designers. 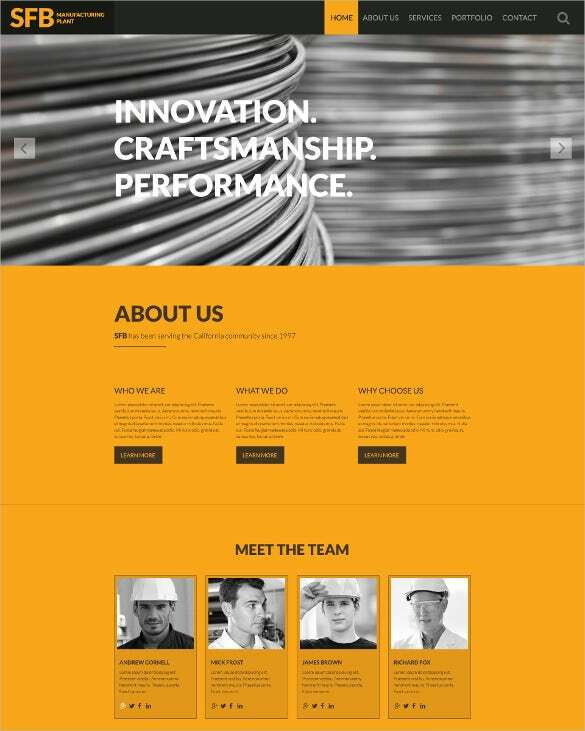 Built with responsive design layouts and OnePage Parallax theme, it also features Video Background Support, multimedia tags, meaning colour choices, multiple sliders and headers, mega menu options which are essential to help build a corporate website. This is a theme format that has a very high resolution range. This is a feature that not just makes the template print ready but also at the same point also makes the template suitable for giving a very high quality of printouts. 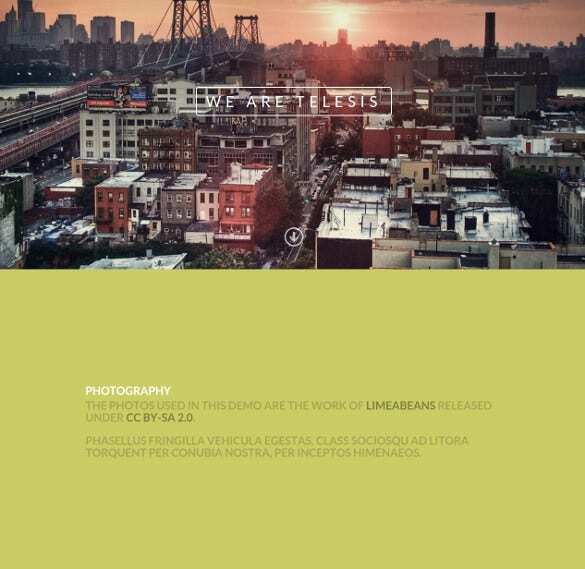 This is a template theme that has an array of great images. The images provided are highly printable and also at the same point they are also very much retina friendly. The templates are much customizable. 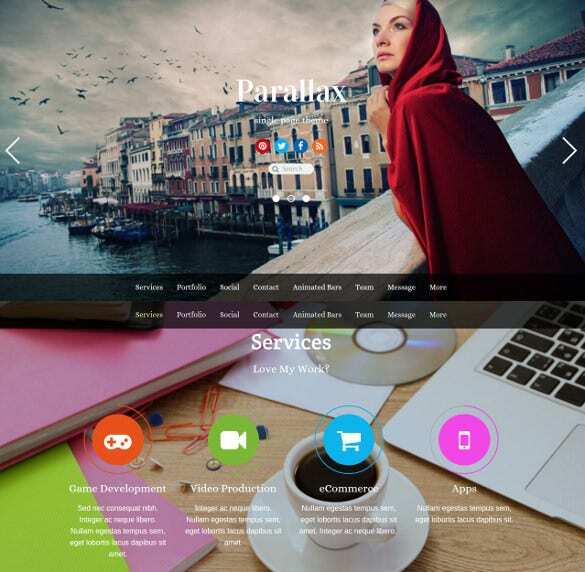 Parallax scrolling and single-page designs are the two features which has made WordPress One Page Parallax Theme as one of the most trending templates among the designers. The photographers and designers use this theme to custom post types to manage portfolio items, highlight, manage and customize the content. Custom header image, sliders, custom menu are additional features. 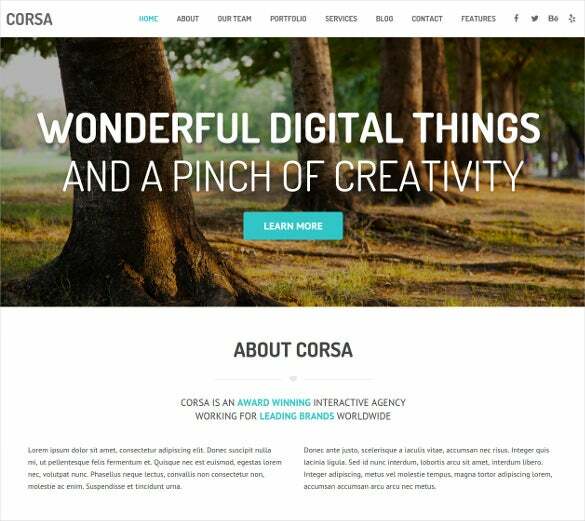 To create a modern professional and flexible one page parallax, Responsive Creative OnePage WordPress Theme has been widely used by the corporate agencies, and also for portfolio, products, and marketing reasons. Layout, styling, colours with retina ready images and fully responsive layout has made it loved by designers from all quarters. 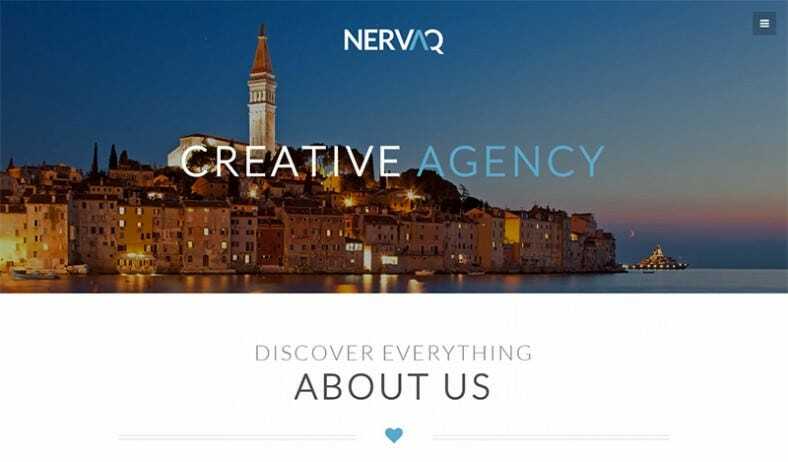 Planning to make a website for creative as well as for professionals? 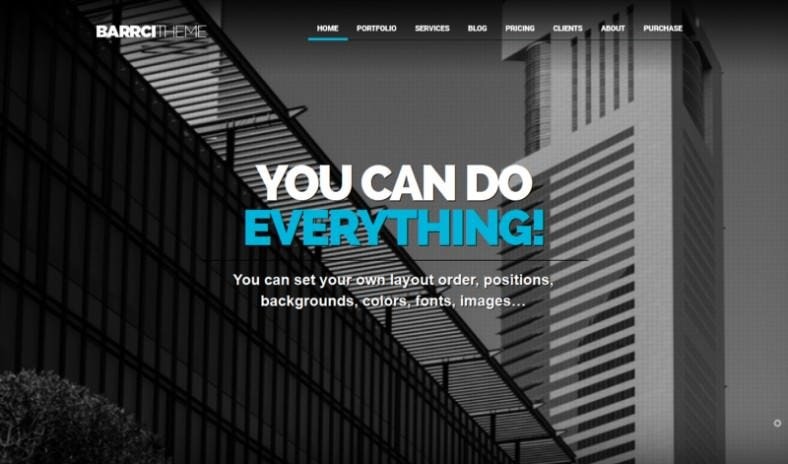 Portfolio One Page WordPress Theme is the answer with truly unique design along with SEO optimised content. It also has Google Analytics tracking code, specially crafted pixel crisp images, cross browser compatibility, translation files and much more to make it perfect for professionals from niches such as web design for apparel stores, sports supplement shops, web retailers, and portfolios. Corporate, agency, photography or general business – no matter what is the need; WordPress Responsive One Page Parallax can serve all their purpose. 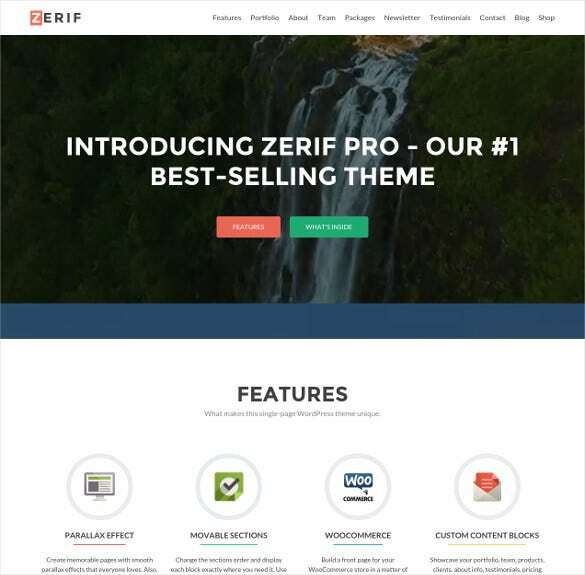 With Background video support, six home sections, customizable backgrounds, plethora of fonts, visual composer, HTML and CSS coding, bootstrap flexible framework, this theme is a trusted name among the designers. This is a template format that has been given a very stylish and rugged look. The color play is interesting and is also changeable. The user can also change the content matter of the template and can easily feed information. 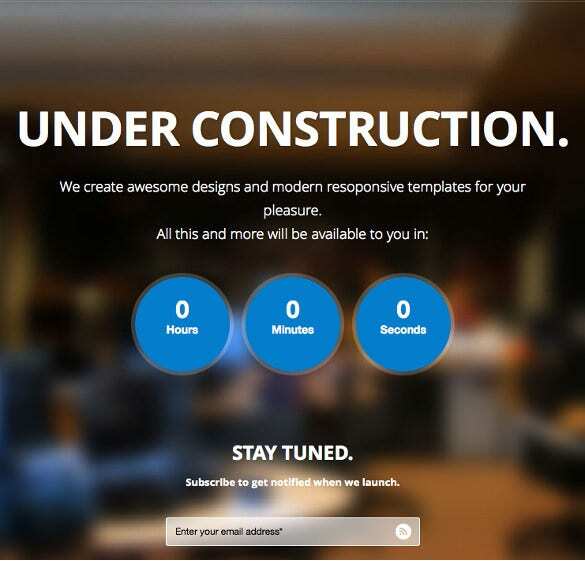 This is a template that has a host of responsive features. The user can easily move about the template. The template is 100% navigable. The theme design is professionally done and is very simple and easy to be installed. 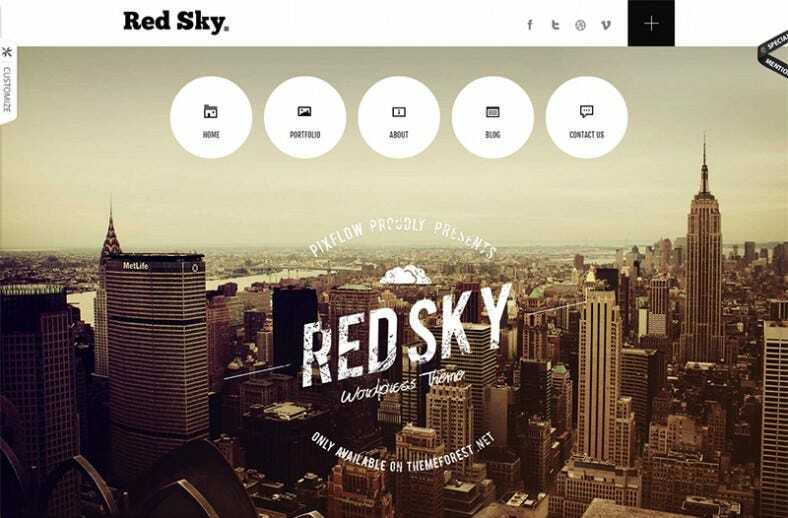 This is a theme layout that can be used to create some of the most interesting websites. This is a theme layout that has a highly generalist concept. Hence this is a template that can be employed for varied purposes. This is a theme format that has a very well organized and structured slide show. This as a feature can enable highly organized and structured websites. The template format can support extra pages. The template is highly SEO compatible. This is a template design that has a high range of resolution. The template is compatible with a wide choice of browsers. Hence the websites developed with the help of this design can be accessed across a wide choice of devices. This is a One Page WordPress theme that has a great admin panel. The user can get this design in the form of word document. The template format has an array of great icon buttons. 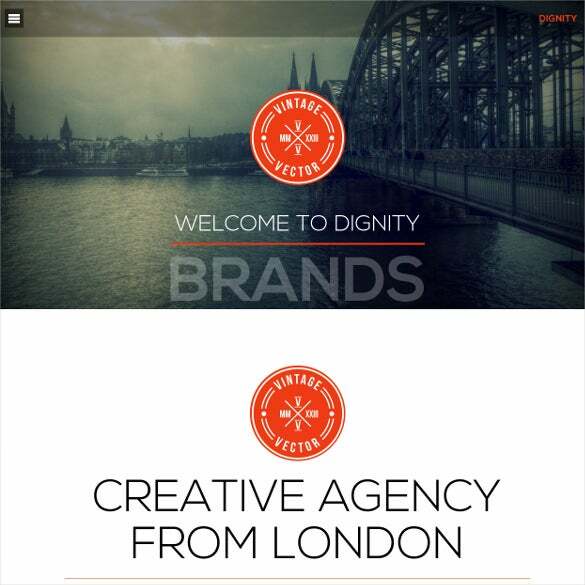 These buttons can make the website more attractive and responsive. This is a template format that can be employed by the user to come up with great website ideas that are simple and effective. The designs of the template shall be so easy that it can be followed by anybody. This is a theme format that can be attained from the internet. This is a template that is SEO friendly and can be printed with a lot of ease and simplicity. The images are super charming and retina friendly. 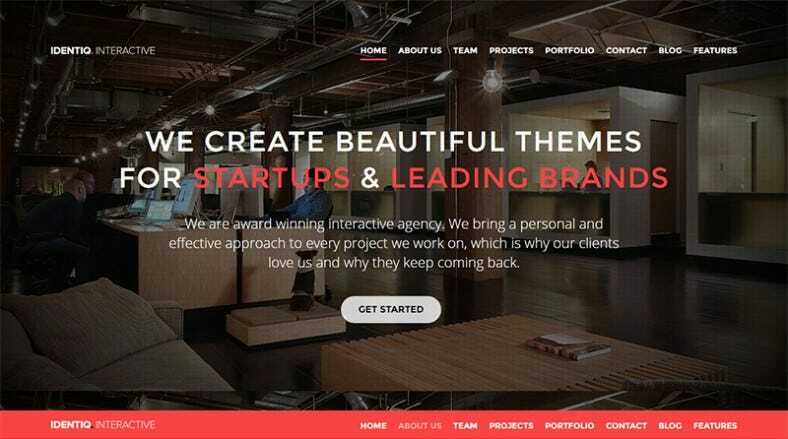 This is a template format that can be very helpful for designing striking websites. The template design has an interesting look. The images are sharp, clear and retina friendly. The color play is very unique and is easily editable. The template design has the facility that can support extra pages. 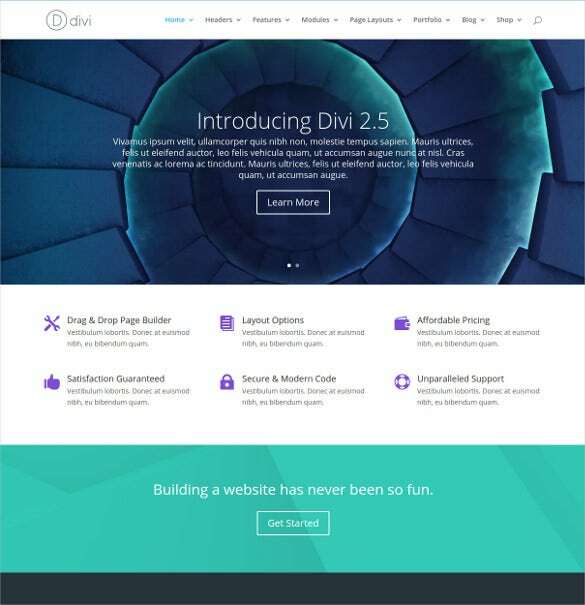 The user can insert extra pages for designing illustrative and elaborate websites. The template design is print ready and has a great resolution range. 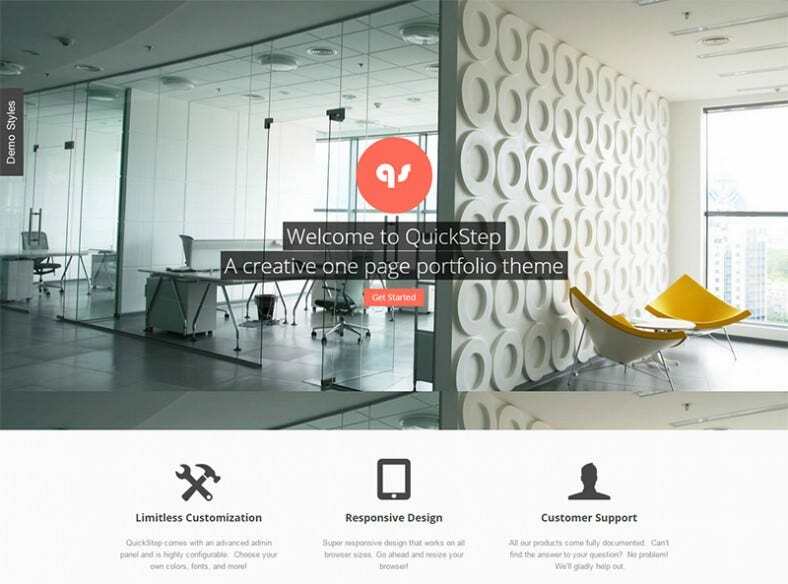 This is a template theme that has a generalist theme. The user can employ this theme for varied purposes. The template is compatible with a wide array of browsers. 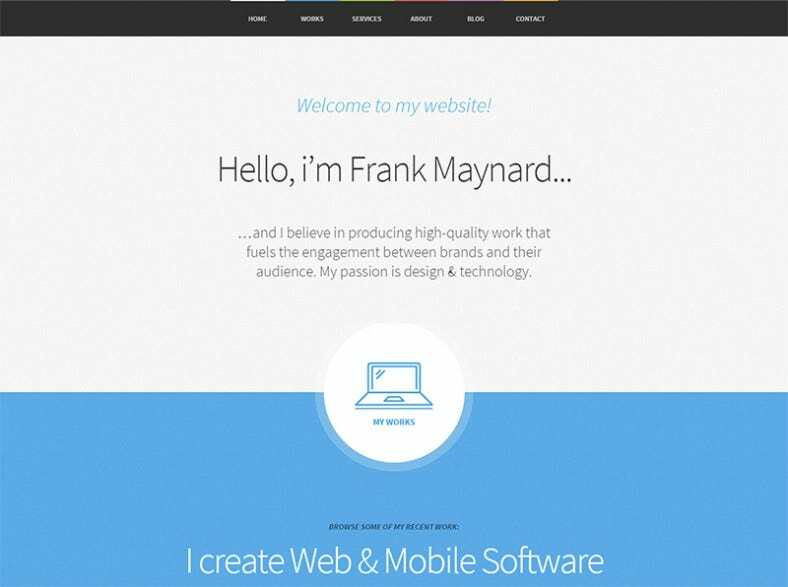 Websites that are developed with this template can be opened across a large number of devices. This is a template design that has a large number of responsive features. The user can edit the content matter and also the background theme. This is a design that is SEO friendly and can support a wide array of information. 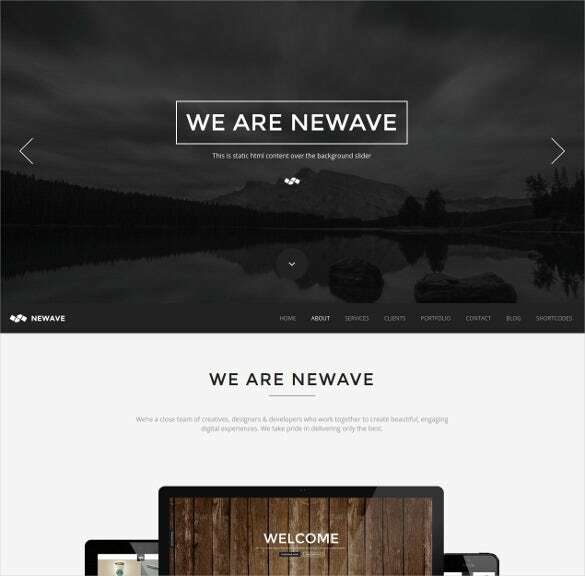 This is a One Page WordPress theme that can be used for the purpose of developing sophisticated websites. He color play is very bright and warm. The template design also contains information and instruction that can help the web designers to develop websites. This is a template design that has a professional design. The template is 100% responsive and is easily navigable. The template has an array of impressive and retina friendly images. The template is SEO friendly. 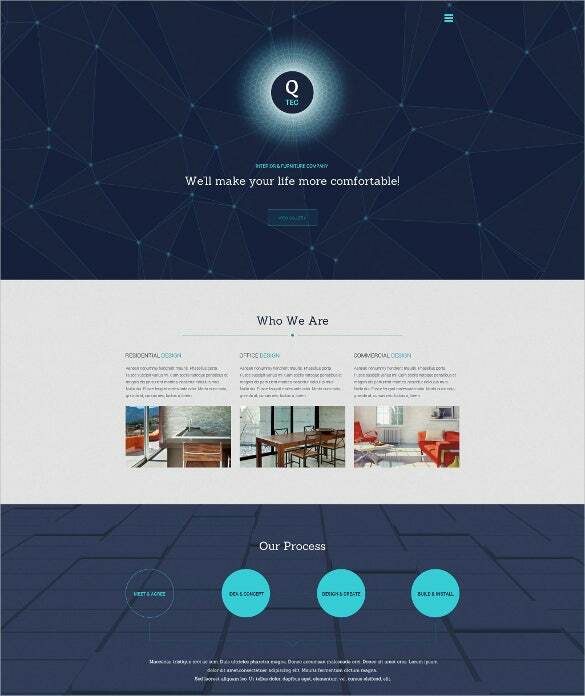 This is a template design that can be used to create very elaborate and well structured website. The template has a well balanced and layered slide show that can help in the process of developing a comprehensive website. This is a theme design that has an array o very interesting color play. The template is fully customizable that can allow the user to change and edit the template with ease and speed. The user can upload information conveniently. This is a template layout that can be easily downloaded from the internet. This design can hold a large amount of information. It is supported by the language of English. The template can support bullet points and paragraph style of writing. 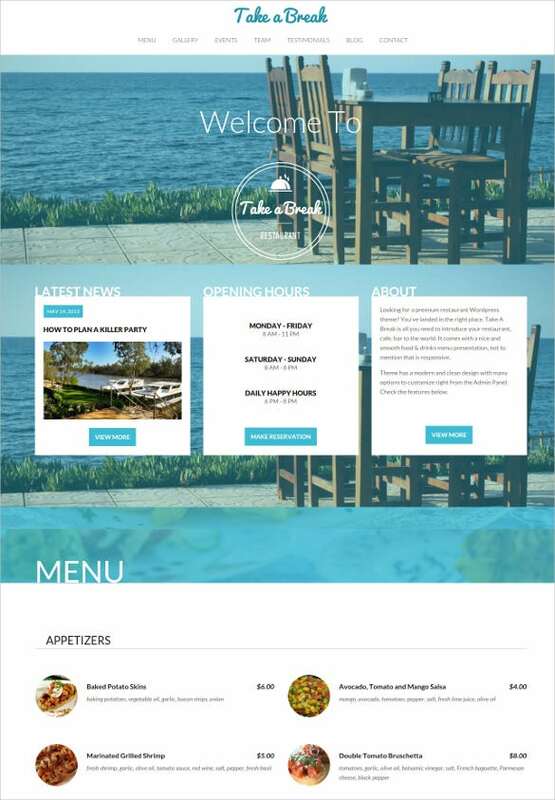 This is a template design that can be used for the purpose of making excellent and exciting websites. The template has a great admin panel and is very easy to be installed. The theme is editable and is SEO friendly. 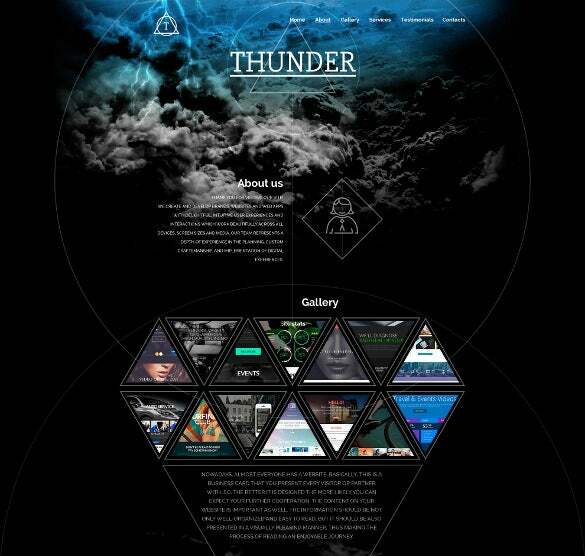 This is a design layout that can be used for the creative websites. The design can support graphics and illustrations. It can also be used for the purpose of embedding videos. This is a template format that can be used for the purpose of making excellent websites. The images provided are super sharp, clear and are retina friendly. The user can get this template easily from the internet. This is a format that can be attained in the form of word documents, PDF and PSD. The template design can support extra pages on requirement. 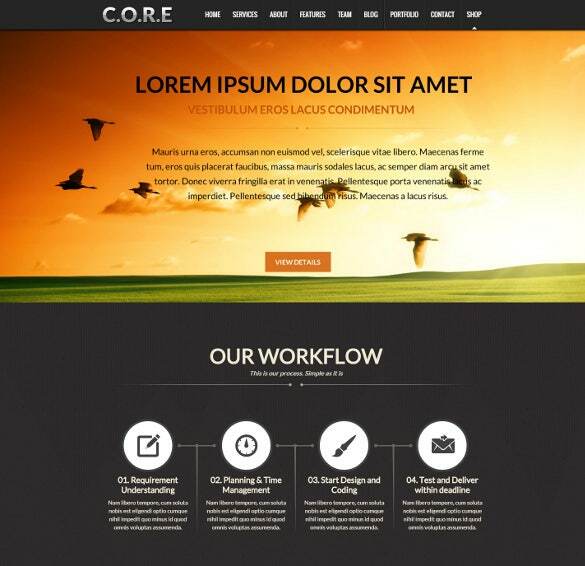 This is a template design that can be used for attractive and informative websites. The range of images is impressive. The template can be used for its super responsive and navigable features and its high resolution range. This is a theme layout that has a super attractive look. 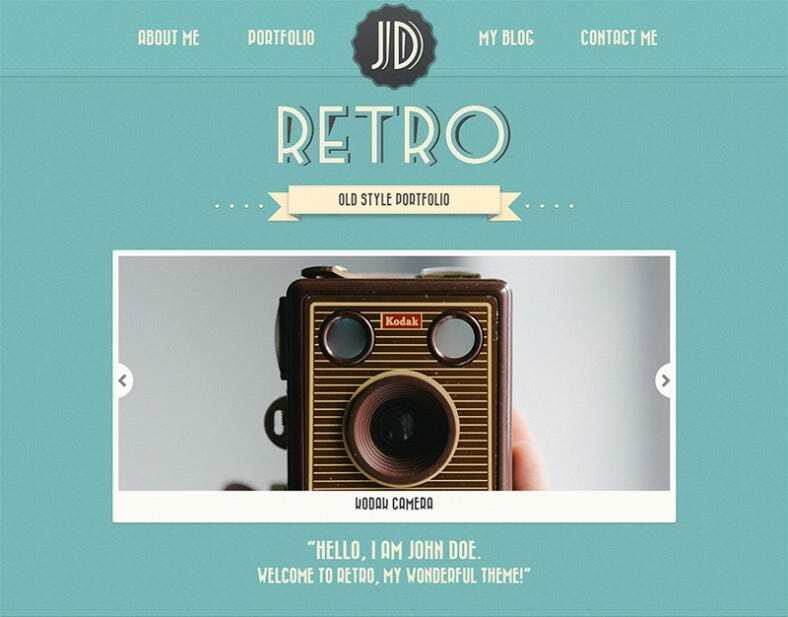 The template has a vintage look that can help the web designer to develop highly offbeat and interesting websites. 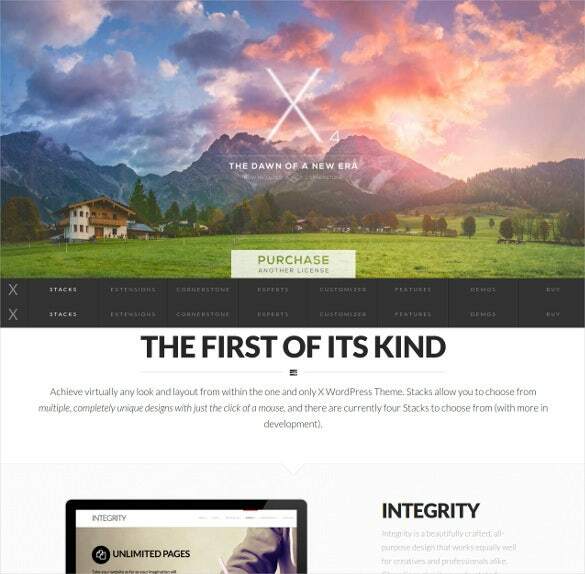 These themes come with dozens of page builder elements, such as parallax sections, responsive sliders, columns, tables and charts, contact forms, etc. ; so, you can use these page elements as you please to create multiple one-page web designs.With the unique parallax and scroll effects that are being leveraged by several new age successful websites, you can establish a sense of professionalism nd quality right away, all because of these Single Page WordPress themes.You may also visit One Page Drupal Themes. These templates are perfect for creating landing pages for all sorts of product sales and service marketing websites, and you get themes with pre-loaded content that you can customize to have your website ready in virtually no time.Unlimited color options, advanced animations control, visual composers, in-page widgets –all these add-ons make your Best One page website truly functional and amazingly beautiful at the same time, thus creating the perfect strong impact on viewers. The One Page WordPress themes and templates are the best tools that can give rise to great and effective websites. 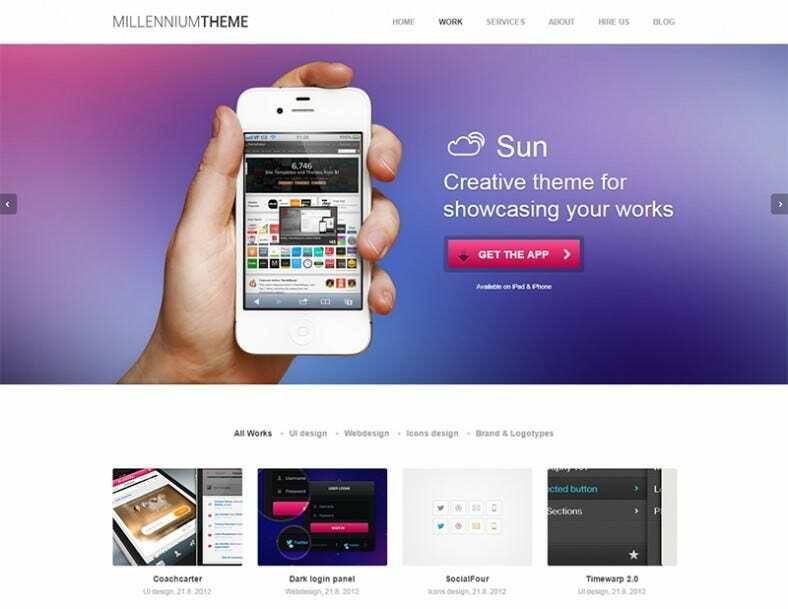 The themes are super attractive and can be used for the purpose of saving time and energy of the user.